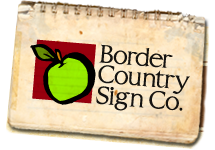 Border Country Sign Co. specializes in custom-made handcrafted signs. From personalized cabin signs to business I.D. 's to resort sign systems. Whether it is your name in vinyl lettering on your shop truck doors, to fully 3D handcarved gold leaf monuments, Border Country Sign Co. can help get you noticed.